Two more slices of J-Horror today ... and a couple of films which I had heard about but not managed to catch up with. 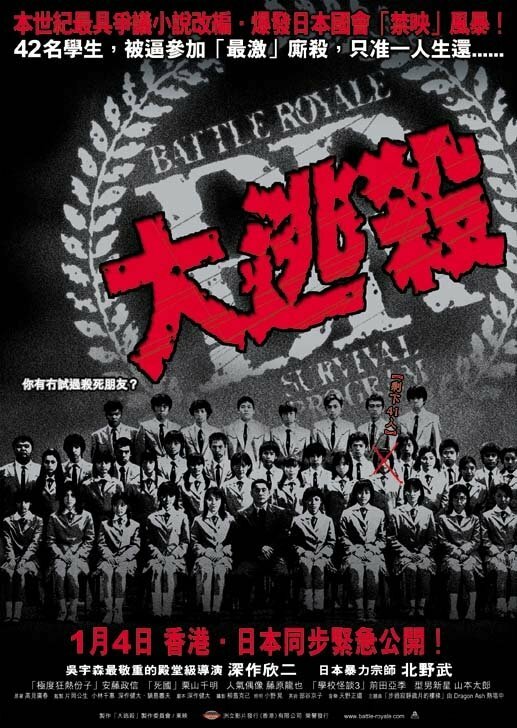 Battle Royale is a sort of Lord of the Flies meets I'm a Celebrity ... Get Me Out of Here ... with just about every weapon you can imagine. The back story is quite nice: the kids of today are so unruly and disrespectful that the only way to try and deal with them is to pick a class at random, ship them all off to a deserted island, and then let them kill each other. At the end of three days, whoever is the sole survivor returns home. And if there is no sole survivor, then all the survivors are killed by exploding necklets which each kid wears. The latest class arrives, and the events are apparently being orchestrated by an ex-teacher of theirs, Kitano, who they tormented. There are 40 kids in total, and unfortunately having so many makes the film drag somewhat. There is not really enough time to get to know them before they are being slaughtered by their classmates either on purpose, or by accident. The set pieces are quite nice, with kids being killed by crossbow, hanging, scythe, revolver, tazer gun, poison ... the list is endless, but the film soon starts to get a little repetative as kid after kid makes his or her maker. I won't reveal the ending here as there is a twist, and it's quite nice - I didn't see it coming even if those I was watching with did. Apparently there are sequels to this outing which are dire and should be steered clear of ... which sounds like a good warning to me. The other film is Phone (or Pon), which is a very effective piece indeed. 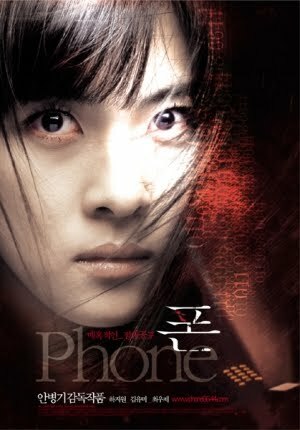 A girl, Ji-won, brilliantly played by Ji-won Ha, finds her mobile phone being called by a mysterious number which cannot be traced. Others who listen to the calls seem to be driven mad by them, and the girl has to try and work out what is happening, and what the connection between the victims is. Best of the lot is the young daughter (Yeong-ju) of a married couple, Ho-jeong and her husband Chang-hoon, who gets posessed by whatever is haunting the phone and ends up throwing herself down a flight of stairs. The young actress, Seo-woo Eun, is simply brilliant and playing the possession, and she is genuinely creepy in a way, perhaps, that Linda Blair was in The Exorcist many years earlier. The explanations, when they come, are all good, and make sense, and the ultimate revelation of who is behind it all is very nicely hidden and revealed. Again, I didn't guess ... and the revelations of what had actually happened are good and gruesome. This is one of the better films of its type, up there with Ringu and the original Ju-On (The Grudge). The sequels are never as good, and the inevitable American remakes often lose the plot and the horror in their translation. But Phone is excellent, and well worth seeking out.